Having a clear plan to your day and to your week can go a long way to helping you maintain a vibrant life. By knowing what you want to accomplish you will be able to focus on your important life priorities. A weekly plan allows you to match your long-term goals to your weekly accomplishments. Your daily plan allows you complete the activities you need to do so that you meet your weekly goals. Strength does not come from what you can do. It comes when you take challenging moments in your stride & determined not to give up. When you go through hardship & decides not to surrender that is strength. Stop dreaming and get moving. People of accomplishment rarely sit back and wait for things to be happened. They went out with determination to make things happened. Hard work is the price of success.You can accomplish anything if you pay the price. Winners are an indicator that anything is possible if you put your heart and mind in a task. Nothing can shake the will or crush the spirit of a determined people. There is nothing more important in life than going after what you love or rather who you love. It doesn't matter where you are coming from. All that matters is where you are GOING! If there is set back never lose heart. In setback there is a hidden agenda demanding more discipline, determination & commitment. It's an opportunity to prove yourself against all odds. To prove your worth, the important point is your conviction, that you are capable of significant achievement or that you have something special to contribute. Nothing can stop me because I have something to prove. The concept of indeterminism opposes this theory. 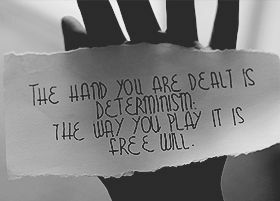 Often, determinism is confused with self-determination of human actions which are a result of his motives or desires. The determinist believes that the universe is akin to a gear of machines, if you are aware of all the parts and rules of its operation, you can predict the future.